, an eminent typographical antiquary, was born Nov. 29, 1718, and educated at Hitchin in Hertfordshire. He appears to have been originally destined for trade, as he was bound apprentice to a hosier in London, and carried on that business for some time on | his own account. It is probable, however, that he did noj succeed, or became desirous of some other means of livelihood, and it is said that one time he studied the art of painting on glass. About his thirtieth year he accepted the situation of purser’s clerk to three East-India ships. He set sail in one of them which was to take in a lading of pepper at Tellicherry: but before she had completed that purpose, an alarm of six French men of war was given. The governor demanded thirty men out of each ship, as he had a power to do, for the defence of the place; and the ship sailed away without lights round the Lucadine islands, and by Mount Delhi, to Bombay. After the alarm was over they returned, and sent Mr. Herbert, in a miserable boat, without change of linen, to demand their men, whom the governor refused to give up, and he returned; but the ships having left their station, the boat could not find them, and the wind being against him, he was obliged to remain at Tellicherry. Being engaged to return to his ship by the middle of July, he was obliged to undertake a journey over land on the sixteenth of that month, with a Portuguese boy, (who understood a little English, Portuguesej and Parriar or Lingua Franca), twelve sepoys, eight porters, in all twenty, besides himself and boy; and went round by sea to Calicut, before he ascended the heights with two bramins, who were bound by their caste to conduct him safe. The anxiety at not meeting the ships at the appointed time, he did not recover for a twelvemonth: though he rejoined them August 8, at Fort St. David, Fort George being in the hands of the French. On his return home, having produced a number (if plans of the several settlements, he received from the India company 300l. These plans were afterwards incorporated into a publication by Bowles, printseller, near Mercers’ chapel. 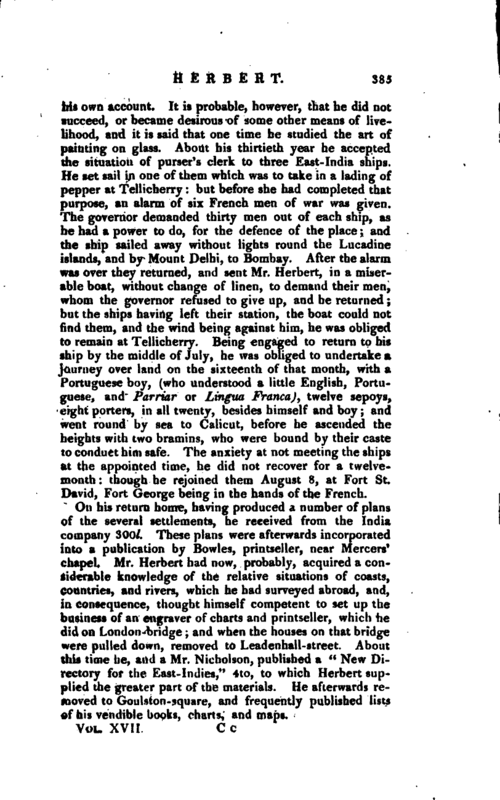 Mr. Herbert had now, probably, acquired a considerable knowledge of the relative situations of coasts, countries, and rivers, which he had surveyed abroad, and, in consequence, thought himself competent to set up the business of an engraver of charts and printseller, which he did on London-bridge; and when the houses on that bridge were pulled down, removed to Leadenhall-street. 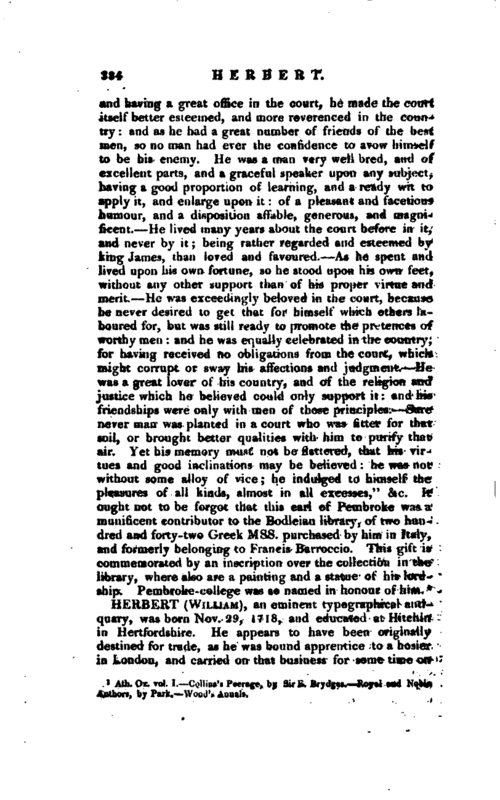 About this time he, and a Mr. Nicholson, published a “New Directory for the East-Indies,” 4to, to which Herbert supplied the greater part of the materials. He afterwards removed to^Goulston-square, and frequently published lists of his vendible books, charts, and maps. 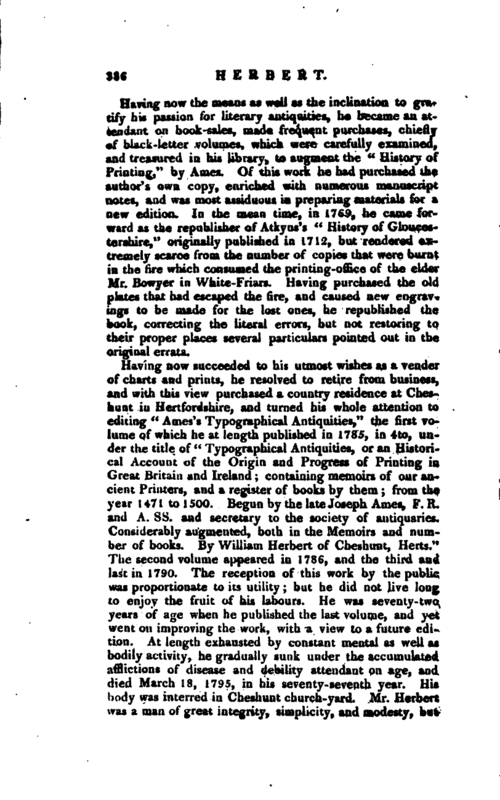 | Having now the means as well as the inclination to gratify his passion for literary antiquities, he became an attendant on book-sales, made frequent purchases, chiefly of black-letter volumes, which were carefully examined, and treasured in his library, to augment the “History of Printing,” by Ames. 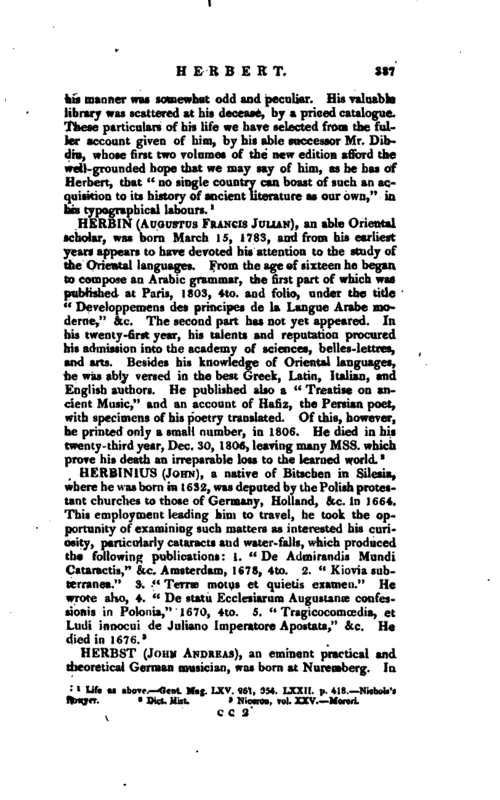 Of this work he had purchased the author’s own copy, enriched with numerous manuscript notes, and was most assiduous in preparing materials for a new edition. In the mean time, in 1769, he came forward as the republisher of Atkyns’s “History of Gloucestershire,” originally published in 1712, but rendered extremely scarce from the number of copies that were burnt in the fire which consumed the printing-office of the elder Mr. Bowyer in White-Friars. Having purchased the old plates that had escaped the fire, and caused new engravings to be made for the lose ones, he republished the book, correcting the literal errors, but not restoring to their proper places several particulars pointed out in the original errata. Life as above. —Gent. Mag. LXV. '261, 554. LXXII. p. 418. Nichols’s Bowser.